The Rolex Turn-o-graph Ref. 6202. Photo courtesy of Phillip's. A vintage advert for the Rolex Turn-o-graph, Ref. 6202. The Rolex Turn-o-graph has long been the seen as the awkward middle child between the Datejust and the Submariner. It remained an oddity in the Rolex collection up until 2011 when production ceased. Why was this? Was the world not ready for the Turn-o-graph or was the Turn-o-graph answering a question no-one was asking? Launching in 1953 with the reference 6202, it is clear that the first Turn-o-graph was the inspiration for the Submariner. Both watches share similar design traits: a black rotating bezel, black dial with gilt chapter ring and an oyster bracelet. The Submariner was still a year from release but production had already begun 1953 and the Turn-o-graph acted as a testing ground for its design. Many people believe that the Turnograph was the first Rolex made with a rotating bezel. It wasn't the very first, but it was the first serially produced Rolex with a rotating bezel. The very first was the rare Ref. 3346 from 1937. The Ref. 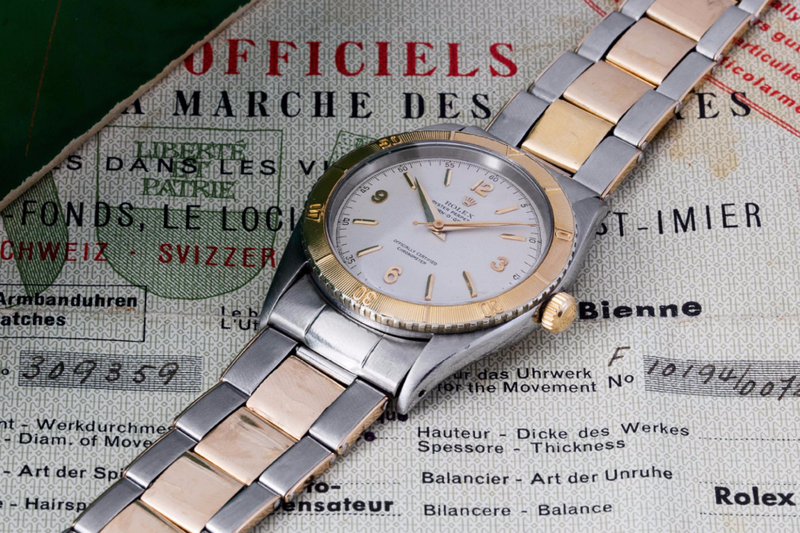 3346, also known as the Zerographe, is the rarest Rolex ever made. It was a prototype and it only 7 to 12 are thought to have been made, with only 4 surfacing at auction. It was the first (and only) Rolex to have a flyback chronograph and the second to have a California dial. Rolex Ref. 3346 'Zerographe'. Photo courtesy of Phillip's. In the early 1950s, it was common to see many design variations using the same reference number. The Reference 6202 is no exception. The most common design looks near identical to the Submariner but instead has a bezel calibrated to 60 minutes, rather than 15. Period adverts show this Submariner style variant with stick hands although many examples exist with Mercedes hands. Another variant has a steel and gold Oyster bracelet with the center links in gold and outer links in steel. Oddly enough, the outside edge of the links has gold plates attached to it. Another dial variation has a beautiful Honeycomb dial (Examples can be found in gold, white and black) with dauphine hands, gold dart markers and Explorer style numbers. Rolex Turn-o-graph Ref. 6202 with Honeycomb dial. Photo courtesy of Sotheby's. Rolex Turn-o-graph Ref. 6202 with steel & gold case and bracelet. Photo courtesy of Phillip's. The new Ref. 6309 changed several designs elements from the original watch. As the watch was now part of the Datejust family, a date complication was added at 3 o'clock along with a cyclops. The new engine turned bezel now had markers every five and ten minutes, not every minute. As well as these design changes, the 6309 used the Caliber 743, replacing the Caliber A260 on the original Turnograph. Changing the Turn-o-graph into the Datejust Turn-o-graph in 1954 makes a lot of sense considering the watches Rolex were making. The Submariner and the GMT-Master were now the watches for pilots and divers and they made full use of their rotating bezels. Rolex Turn-o-graph Ref. 6309 with dauphine hands and diamond hour markers. Photo courtesy of Phillip's. By changing the design of the Turn-o-graph into a dress/sport watch combination, Rolex saved themselves from having two watches compete against each other. The Submariner was for divers, the Turn-o-graph was for professionals and businessmen. As period adverts said, the bezel was "a reminder of times past, for phone calls, conferences, timing, parking and countless other ways". 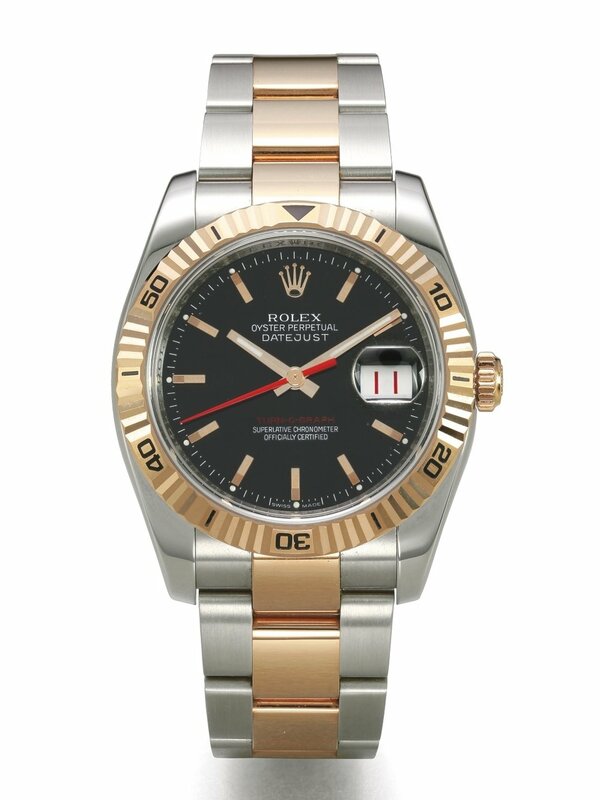 Rolex Turn-o-graph with yellow gold bezel. Photo courtesy of Theo & Harris. The reliability of the Turn-o-graph also helped give the watch its nickname, the Thunderbird. The Thunderbirds was the nickname for the USAF Air Demonstration Squadron. Founded in 1953, the Thunderbirds were the first supersonic precision aerobatic team, cruising above crowds at 730 mph. Eventually a Turn-o-graph ended up on the wrist of a Thunderbird pilot and it impressed him so much, that the squadron requested that Rolex supply them with watches. Rolex capitalized on this relationship and began referring to the Turn-o-graph as the Thunderbird in North American advertising. Thunderbirds Turn-o-graphs issued to the Thunderbirds had the insignia of the squadron at 6 o'clock. These Turnographs with the Thunderbird insignia are incredibly rare as they were only given to the handful of pilots talented enough to make it into the aerobatic team. 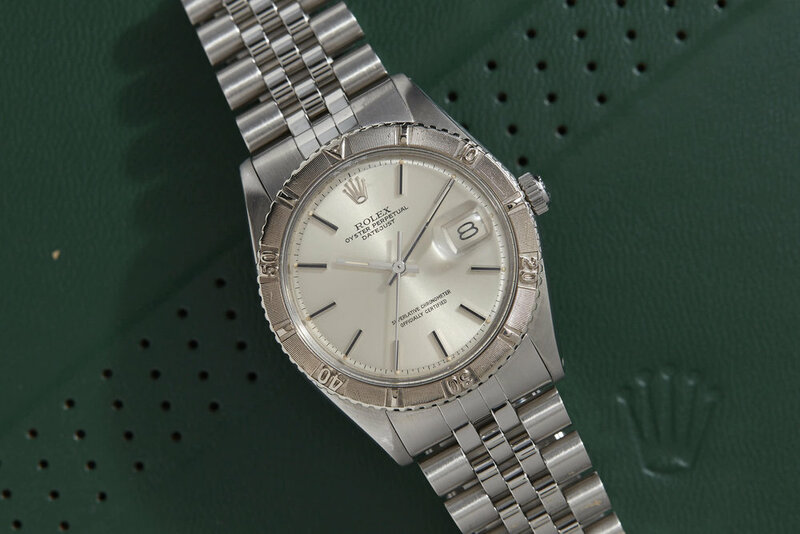 This article from Rolex Passion Report showcases an amazing Ref. 6609 given to Captain Charles W. Maultsby in 1959. The Ref. 1625 was produced from 1959 to 1977. Like the original Ref. 6202, the Ref. 1625 came in a wide variety of case metals and dial configurations. Listing them all here would be impossible. The Ref. 1625 had the longest tenure of any Turn-o-graph and in 1977 it was replaced with the new references: 16253, 16263, 16264 and 16268. These variants all used the 27 jewel Caliber 3035 and did not have Turn-o-graph written on the dial. Instead they read Superlative Chronometer Officially Certified at 6 o'clock. Why exactly Rolex chose to continue using the Turn-o-graph bezel without the name is unknown. 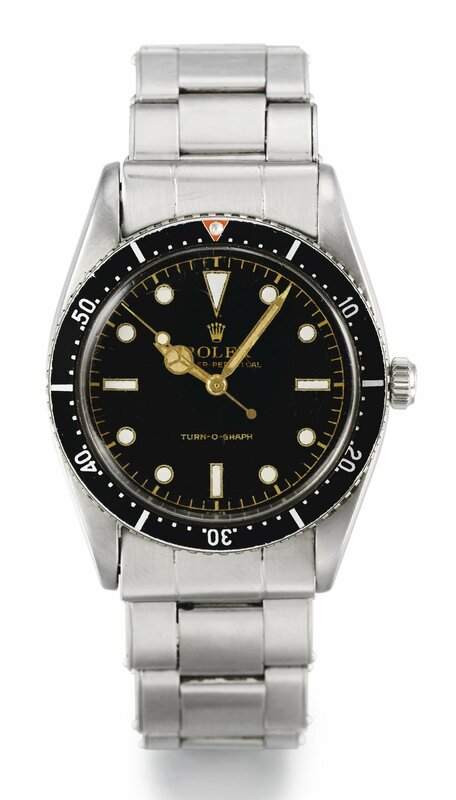 Perhaps Rolex though that the name, like the omatic moniker, was too mid-century for modern watches. These references were produced from 1977 until around 2000, when they were replaced with the six digit references 116262, 116263 and 116264. These modern references were still a modest 36mm but the thick fluted bezel makes it wear much larger. For the first time, a Turn-o-graph now had a rotating fluted bezel. To allow for easier timing, Rolex engraved stick markers every 5 minutes between the 10, 20, 30, 40, 50 and 60 numbers also on the bezel. The name Turn-o-graph was back on the bezel, highlighted in red along with a matching central seconds hand. These new modern Turn-o-graphs were available in white, black and blue dials. Rolex Datejust Turn-o-graph Ref. 116263. In 2011, Rolex ended production of the Turn-o-graph after 58 years. Looking at all 11 references from 1953 to 2011, it is easy to see why the Turn-o-graph is not remembered with as much fondness as other Rolex watches. Throughout its entire life the Turn-o-graph has either been an oddity or has been overshadowed by better watches. In 1953, no-one knew what to make of a rotating bezel on a watch. By 1954, Rolex had created two classic sports watches whose bezels would be a key part of their appeal, the Submariner and the GMT-Master. The design change of the Turn-o-graph, from Submariner-esque to dress/sports combo, meant that it would never create a solid impression on the public (despite endorsement from fighter pilots). Absorbing the Turn-o-graph into the Datejust line might have seemed like a good idea at the time but in hindsight, I believe it doomed the Turn-o-graph. Stuck under the banner of the iconic Datejust, which for better or worse is never allowed to change, the Turn-o-graph could never evolve into something greater. The best design is spontaneous result of form following function. The Turn-o-graph never had a real function past 1954 and its form was restricted to the design language of the Datejust. Earlier references had a mid-century elegance to them but later pieces, especially the modern Turnographs of the 00s, fail to capture the same feeling. Because of this, the Turn-o-graph represents something very unique among Rolex watches. It was worn by fighter pilots and it was a historical first for the brand, but it has been relegated to 2nd tier status. For those looking for a good deal on a quality vintage watch with interesting history and a unique look, then the Turn-o-graph might be a perfect choice. Rolex Passion Report: Rolex Ref. 6909 belonging to Captain Maultsby.